Brazil’s electoral law reform, approved in 2009, will have a positive impact on the October 2010 general election by giving citizens access to more information than ever before. Furthermore, many emerging transparency projects from civil society, the private sector and the public sector are working together, actively using new technology tools to make the election visible and to get citizens involved in the upcoming celebration of democracy. Next October, about 135 million [pt] Brazilians will vote for president, governor, senator, federal and state or district deputies. Last year, the Electoral Reform [pt] opened the doors for politics 2.0 by authorizing parties to use social networks (Twitter, Facebook and others) to raise campaign donations and participate in streamlined debates. Before the elections, multiple projects were already working on issues such as transparency, civic engagement and public policies monitors. Google created an election platform [pt], compiling information about presidential candidates and displaying an interactive map showing election results since 1994, as well as bringing together the most active civil society initiatives: Campanha Ficha Limpa (“No Criminal Record Campaign”), Excelências (“Excellences”), Movimento Voto Consciente (“Conscientious Vote Movement”), VotenaWeb (“Vote on the Web”), and Eleitor 2010 (“Elector 2010”). Google’s platform encourages voters to ask questions to their candidates by submitting them via a YouTube channel. The best questions, as chosen by the platform users, will be answered by candidates on television. Paula Góes, Global Voices’ Multi-Lingual Editor, wrote about Campanha Ficha Limpa: “The Ficha Limpa (No Criminal Record) bill…seeks to prevent politicians who have committed serious crimes, such as misuse of public funds, corruption, murder and drug trafficking, from running in elections.” The Movimento de Combate à Corrupção Eleitoral [Movement Against Electoral Corruption] created the campaign in 2008 and prepared a bill (in Brazil, the citizens can propose a bill if they obtain a certain number of signatures). Avaaz.org played an important role in collecting signatures and putting pressure on the legislature to approve the bill. The Ficha Limpa Law was enacted by president Luiz Inácio Lula in June 2010. The Superior Electoral Court ruled that the Ficha Limpa Law is valid and enforceable for the 2010 elections. After that decision, the founders of the campaign launched a website to monitor candidates’ compliance with the law, with additional features like visualizing gathered data and news from the media. The site also includes a form to report candidate misbehavior. If a candidate wants to be listed on the Ficha Limpa site, he or she must fulfill a pledge of transparency during the campaign by presenting a weekly report on his or her spending and other information. Forty candidates have already registered. Voto Consciente is an association that was founded in 1987. The objective is to consolidate citizen participation by informing the public about politicians and their competencies. They also have a website to present that information and news about the association. They have many online activities, such as participation in social networks, publications and videos. For example, the movement in the city of Jundiai published a document about 16 candidates for state deputy and information about how citizens can use the Internet to supervise politicians or propose solutions for their city’s problems. The other projects presented in Google’s platform have been documented as case studies on the Technology for Transparency Network. VotenaWeb was studied in the first phase of our research, while Excelências and Eleitor 2010 will be presented in the coming weeks. Votenaweb allows citizens to compare their votes on congressional bills with the politicians’. Using a clear interface, congressional bills are translated into simple language with clearly defined context and consequences. In addition to monitoring the voting records on particular bills, users can also interact with the political landscape by symbolically voting for or against each bill. This tool helps citizens choose who to vote for by enabling them to find candidates’ voting records in recent years. Excelências was created in 2006 by Transparência Brasil (“Transparency Brazil”). Excelências uses the Internet to make information about Brazilian parliamentarians available to the public. They use official data to increase transparency surrounding 2368 politicians. As with VotenaWeb, Excelências helps inform citizens about the candidates in the 2010 elections. 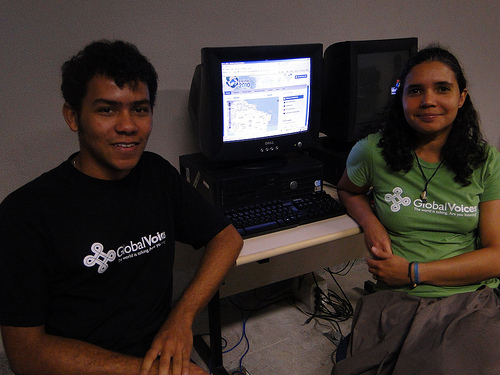 GV contributors Paula Goes and Diego Casaes are the coordinators of Eleitor 2010. Eleitor 2010 (“Elector 2010″), which was recently covered on Global Voices by Janet Gunter, intends to monitor Brazil's elections in 2010. The project uses the Internet to receive complaints about irregular campaigns during the elections. It uses the crowdsourding platform Ushahidi to document and map content submitted by citizens via SMS, email, Twitter, and various social networks. The coordinators are Paula Goes and Diego Casaes, both of Global Voices. Multiple projects in Brazil track candidate behavior and monitor politicians’ work after they are elected. Congresso Aberto (“Open Congress”) visualizes and analyzes official data from Brazil's Congress. In Cidade Democratica (“Democratic City”), citizens document and discuss municipal problems and solutions as well as discussing candidates’ proposals and visiting candidate profiles. Finally, Adote um Vereador (“Adopt a politician”) encourages Brazilian citizens to blog about the work of their local elected officials in order to hold them accountable. Though Adote um Vereador currently focuses on local politicians, Milton Jung, one of the founders, hopes to extend the project to national politicians elected in October. 10 Perguntas (“10 Questions”): Until September 3, citizens can send questions for the president candidates. After this date, the top 10 questions chosen by the users will be answered by the candidates. Eu lembro (“I remember”): This website searches for information about all candidates in social networks as Twitter, Wikipedia, Busk and YouTube. It also provides a platform where users can discuss the candidates. Quanto vale seu candidato? (“How much is your candidate worth?”): This site allows citizens to visualize information about the property holdings of various candidates. Voto Certo (“Right Vote”): This website contains information about 2010 elections such as candidates, campaign financing, and electoral campaign map and a timeline. The upcoming elections are marked by the highest Internet usage ever in Brazil, both by candidates and by citizens. For example, all candidates for president have accounts on Twitter and other social networks. The first online election debate, promoted last week by an Internet provider, surpassed 1.7 million hits and led the trending topics on Twitter during that period. At the same time, these tools are not restricted to use by candidates and media. Several NGOs, citizens and companies are using the Internet to improve access to information about candidates or supervision of the campaign. Google’s platform presents part of these experiences. Hopefully technology tools and connectivity will help Brazil to elect better politicians for the next four years and to create a database about these politicians that will help hold them accountable for their actions in government. Despite the relatively short time of using these tools, we can say that by Brazil’s next elections, the Internet will be established as a space to promote greater information on candidates and the actions of government. Pingback: Links from the Cave of the 40 Thieves | Inspiration… Tomorrow. Bravo to Brazil on allowing the people to make their voices heard! Any step that allows the people to connect with politicians is a step in the right direction. Hi, there is one little correction that has to be made regarding the MCCE, the Ficha Limpa and Avaaz. In order to present this bill to Congress, as our Constitution provides, MCCE spent two years gathering the 1.5 million signatures, in paper, and whoever signed it had to provide their electoral registration number, ID number, etc. These signatures had to be delivered, physically, to the Chamber of Deputies. I think this is the main obstacle for citizens to propose bills, even though it’s a constitutional right. In fact, the Ficha Limpa is the 3rd such one since 1988 to be passed by Congress. The Avaaz petition, on the other hand, was created after the bill was proposed. Each electronic signature would send an e-mail to each Congressman, pressuring them to give this bill priority and to vote favorably.